LSHA Board members are appointed by the Governor. 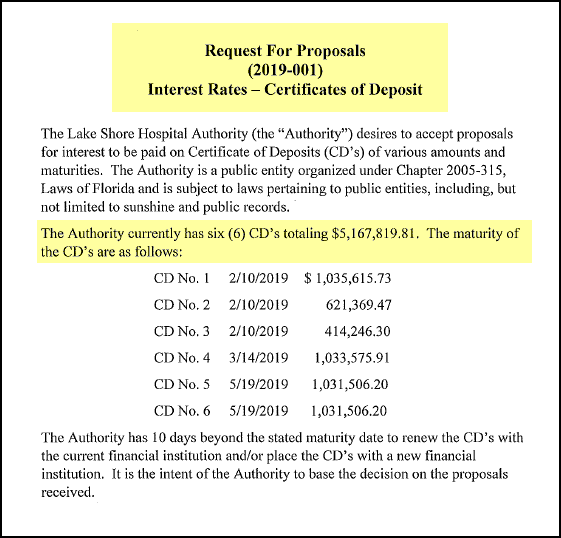 On February 11, 2019, the Governor's Board, instead of allocating $5 mil as clearly pointed out in the RFP, reinvested just about every last dime of Authority money, $14,015,459. The recommendation to do this was made by Authority Manager Dale Williams and inside-outside-auditor-accountant-financial advisor (all one person) Richard Powell. Tonight's Authority agenda has the "Bid Protest" front and center on the docket. The Authority agenda also has this note: "Note – A Settlement of the Bid Protest MAY BE discussed and approved." According to Columbia Bank's attorney, Joel Foreman, Columbia Bank has not submitted any settlement proposal to the Authority. Making up "stuff" is nothing new at the Lake Shore Hospital Authority. The Governor's LSHA Board members are the following: Brandon Biel, Lory Chancy, Janet Creel, Stephen Douglas, Jay Swisher, and Dr. Mark Thompson. The conversation should be interesting. The person to keep one's eye on is LSHA Attorney, Fred Koberlein, Jr., who intentionally speaks so softly that many times he cannot be heard from a few feet away. While this is a clear violation of Florida's Sunshine Law, this appears to never have bothered the Authority Attorney, or the Governor's Board. 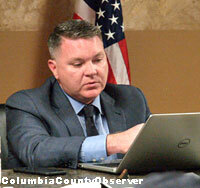 Attorney Joel Foreman will be presenting Columbia Bank's bid protest.